And it's also National Cat Day today, but isn't it always? To celebrate, here's a funny video of myself caught in the moment! Am I embarrassed? No, I am not, so enjoy and LOL - or MOL! Love the Halloween selfie, and liking it is every reason to share. What a festive Halloween selfie today!! Yur toetallee kewl Athena an Lady Marie! Luvley video mee furend! Marie, that's an awesome "Halloween selfie" of Athena and you, and Athena, I must say, that's a great video you rolled around in, so perfect for a day like today, "National Cat Day!" Thank you both so much for sharing! 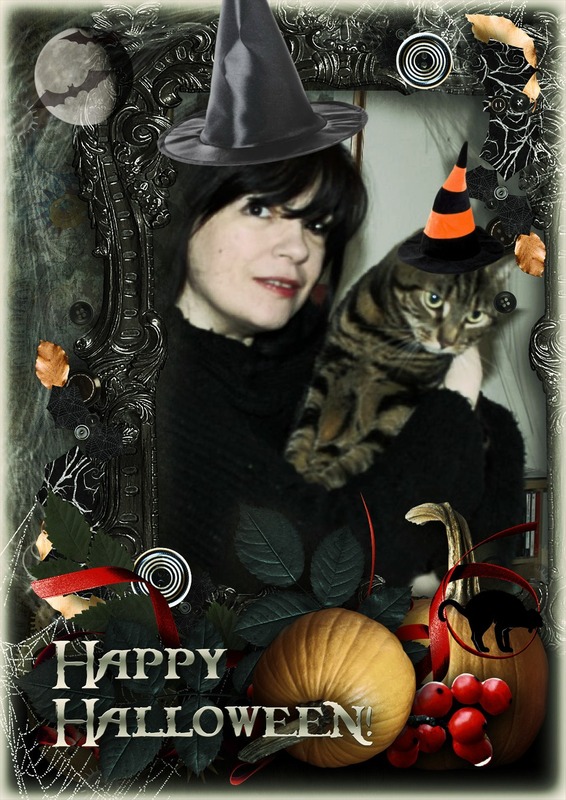 I love cats, autumn, Halloween, and this site you both have! If you'd like to stop by my place as well, just click my name in this comment of mine, if you'd like to meet a real Witch! This is a most wonderful shot of you and your human! Very excellent for the upcoming Halloween! Was that towel fresh out of the dryer ? Purrs ! What a fun Halloween selfie! Love the Halloween graphic! Wow, you sure are enjoying that towel in the video. We love you and Mum's Halloween selfie, Athena! Athena, you are a cat's cat! That's a fantastic Halloween selfie. I like all the little details like the bats flying in front of the moon. Yes, every day is cat day!